Investing with us is straightforward. Following an initial consultation so that we clearly understand your investment ambitions – we want to know the timescales you’re working towards, your attitude to risk and so on – we will be most glad to provide you with some recommendations based on your requirements. One of wine’s great benefits over other asset classes is that the market is broad and deep, with many producers in many regions offering their product over multiple vintages. In this sense, it is much like a mini stockmarket, whereas gold will always just be gold and oil will always just be oil. There is no homogeneity in the wine market, but there is sufficient fungible supply so as to prevent it becoming overly specialised like, for example, art. These characteristics allow diversification within the asset class itself, which can be used to mitigate risk. A common mistake made by many newcomers to the market is that they attempt to manage risk by minimising their financial exposure, and so ‘dip their toe’ with a single case. But in actual fact this investor has placed himself at the polar extreme of the risk spectrum because his return rests in the fortunes of that one case. We would always advocate diversification through a portfolio approach – like stocks and sectors, wines do not all move up and down at the same time or rate. It is our job to try and ensure that our clients’ portfolios are exposed to wines with the potential for maximum price appreciation, and to avoid those with the biggest downside threat. 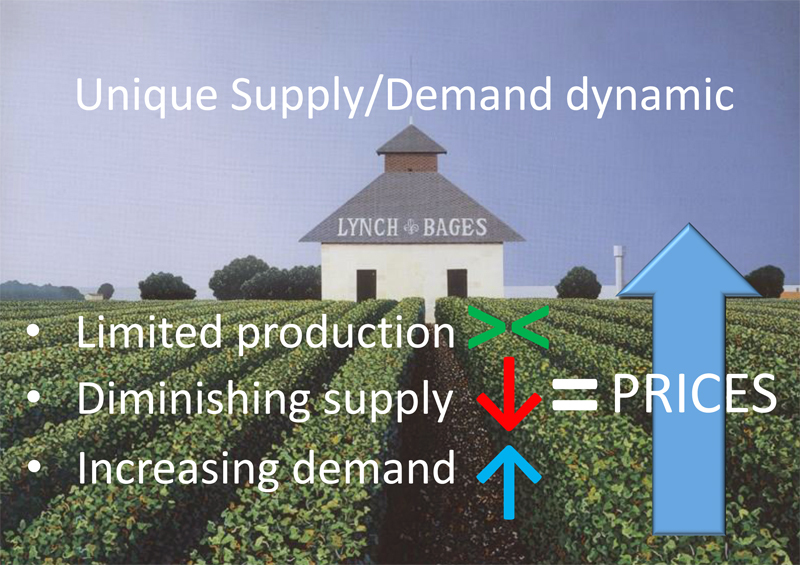 Wine investment is often touted as being predicated on a supply/demand dynamic. This is patently true, but then, aren’t all markets? But a couple of supply/demand characteristics of wine are genuinely unique. The first sits on the supply side: unlike other luxury commodities, supply cannot be increased. Once the production of any chateau in a given vintage (year of production – each one totally unique) comes to market, that’s it – there will never be any more. Over time this supply will actually reduce as the wines are consumed – fine wine being one of the only luxury commodities that can be used and enjoyed just once. The result is a perfect inverted supply curve that is truly unique to fine wine. The importance of this from an investment perspective this cannot be overstated. If sales increase for Range Rovers or Hermès handbags, it’s relatively straightforward to raise production to meet demand. With wine, it’s quite the opposite; as demand grows the inverse supply curve accelerates. On the demand side, too, wine has some helpful characteristics. Fine wine, by definition, improves with age in the bottle. Consequently, as it matures and enters its prime drinking phase, it becomes more desirable and therefore subject to greater demand. Schoolboy economics: rising demand coupled with falling supply = increasing prices. There are precious few investments with a legitimate CGT break, so investors to whom this is of relevance would be wise to explore wine. Of course, taxation is a complicated area, and whilst we can offer you our understanding of the current HMRC view, we are not tax experts, and so strongly urge you to independently consult with one before making your decision to invest. If you would like a list of our current recommendations please fill in the form below.